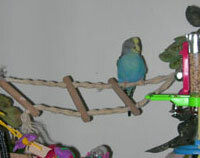 Budgies need many different kinds of toys! 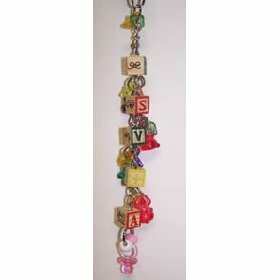 Look for toys with bells, spinning things, anything with mirrors, swings, ladders, and soft wood or paper that they can chew or shred. We have bought nearly every budgie toy in existence. Some toys the birds love and play with incessantly and some they just ignore. 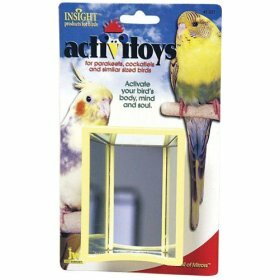 I've listed the toys that the budgies really loved and played with constantly. 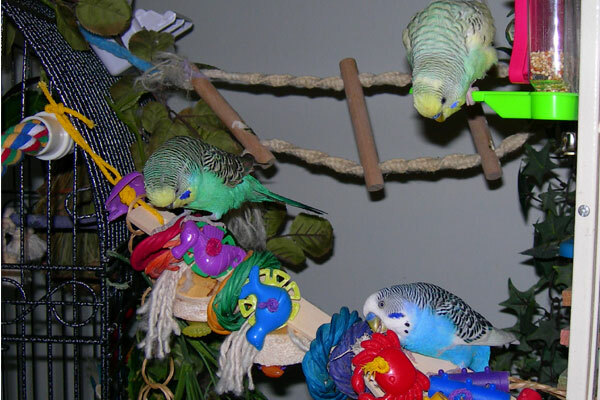 I hope your guys will have as much fun with these bird toys as our budgies did! 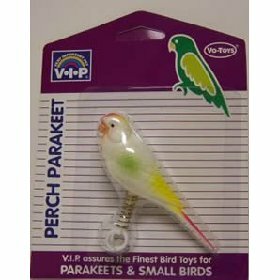 Don't just give your keets the tiny bird toys made specifically for budgies - some of the bird toys made for larger parrots can be just as fun for budgies! 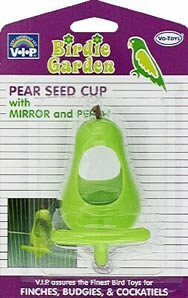 Just make sure they're safe - ie: don't have parts that budgies could get their heads stuck in, but a bigger bird couldn't. Also, remember, parrots love to chew and need to chew to keep their beaks healthy! They need toys that they can shred and chew on and destroy! We've heard horror stories of poor little budgies who spent their days without toys to play with because "they just destroyed them"! Well, yes, they should! That's what they do! 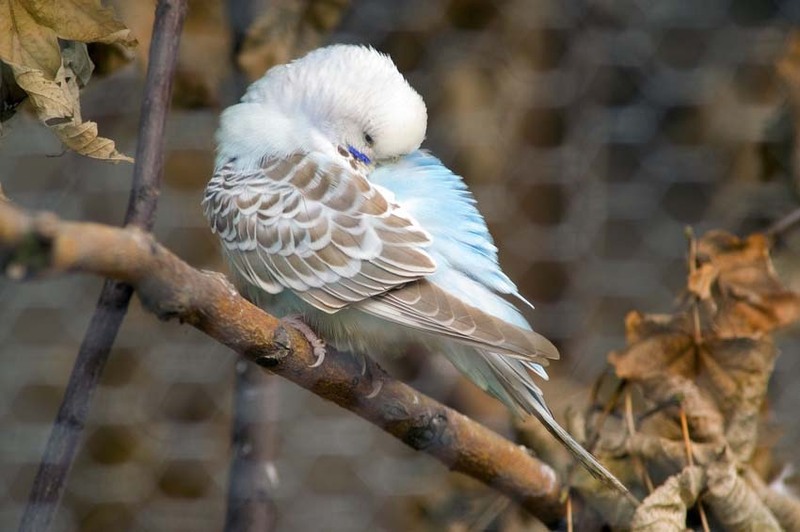 A budgie without different toys to play and engage their intelligent mind with will quickly become bored and may turn to destructive behavior like destroying furniture or feather plucking. 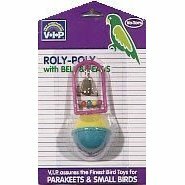 Make sure to trim any frays or strings from toys so that budgies don't get their toes caught in them. 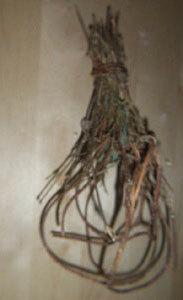 Make sure no strings or anything a budgie could get their head caught in is hanging down from the top of the cage. 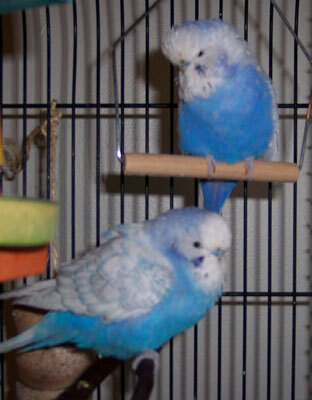 We lost our gorgeous English budgie, Statler (pictured on the swing, his brother Waldorf on the perch), from a string on a toy that was lying on top of the cage, but the string had come down inside the cage, forming a loop. Statler was sleeping on top of his happy hut and the string got wrapped around his neck somehow. Horrible! 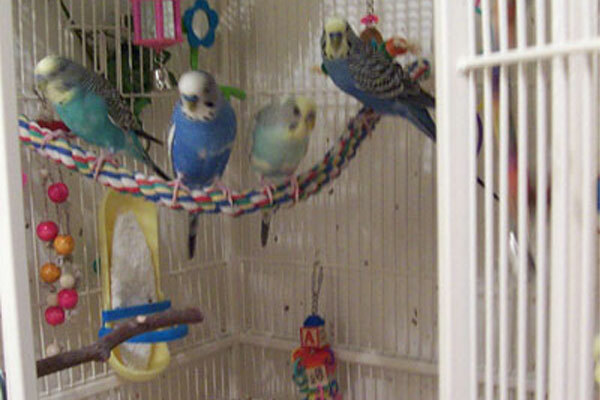 Here are our budgie's' favorite toys. This is Skye's FAVORITE TOY, EVER! She is always sitting on it, spinning the flower and throwing the buckets for me to fetch. She also likes to grab the buckets and run them across the bars of her cage like she's in jail. It makes a nice big ringing sound. All the bubs fight over who gets to sit on this thing. 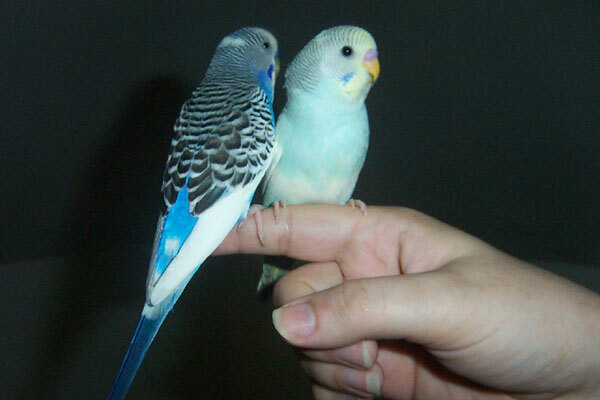 I birdsat a parakeet off of craigslist once, Zacharista, who liked to peck the hell out of this thing. Too funny! Great foraging toy. 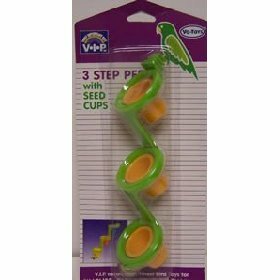 Place several different types of seed cup toys around the cage and put treats in them before it's time for the birds to go back in their cages. 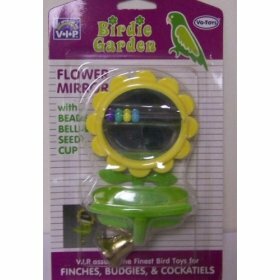 Makes putting the birds away easy because they are racing each other to all the cups to see what goodies there are! 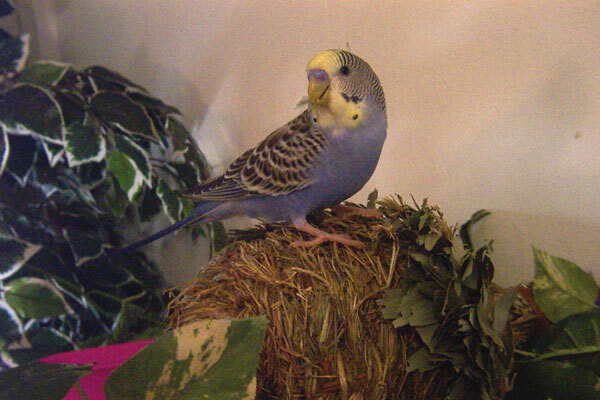 My budgie, Skye, enjoys beating this up. She gets all into it, flapping her wings & displaying. Not sure if she loves it or hates it. Regardless, she pays it a great deal of attention. 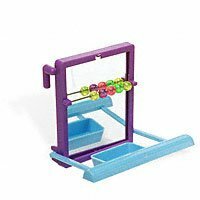 I like to have several of these types of toys all around the cage to hide treats in before it's time to go back into the cages. 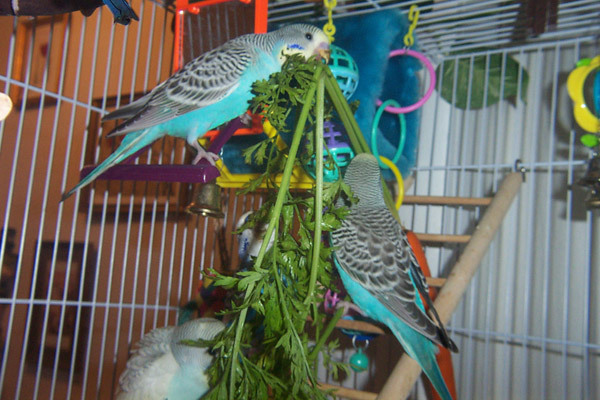 The budgies are then excited to go back into their cage to forage around to each perch cup and see what's there. No more chasing everyone around the room for an hour because they don't want to go back in. 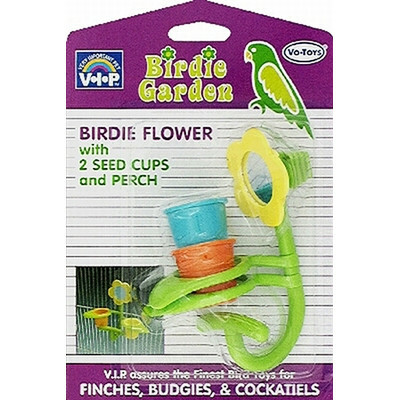 Avian Select is another great brand of budgie toys. Our guys love their mirror toys - especially the mirror-bottom bathtubs. Cloude and Dandelion have claimed this one. They sleep on it every night and the other guys are very jealous. Cloude also likes to sit on the perch below the swing and wear the bell as a hat. I put one of these at the end of each perch. 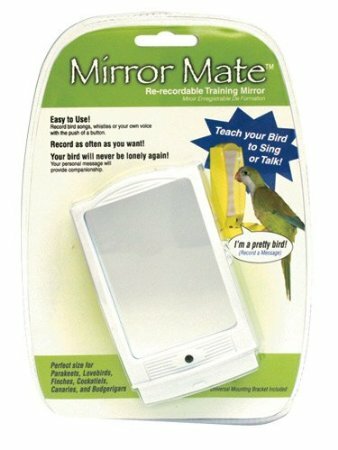 The budgies love to beak-peck & burble at the hottie in the mirror. All the best bathtubs have mirrors at the bottom. My guys fight over this one. Get several! 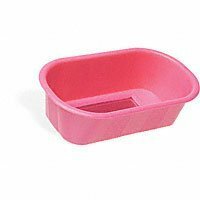 You can also use these as little food troughs. Yay! 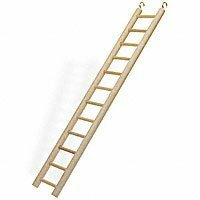 They all love ladders. Climbing them right-side-up and upside down, hiding under them, chewing on them. Fun! Good for inside and outside the cage. 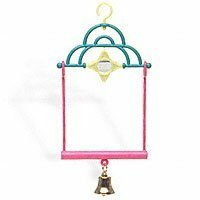 These make fun perches strung inside a cage in the corner. 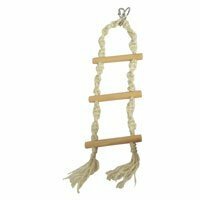 Galileo chillin on the macrame ladder/bridge. 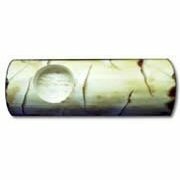 Another great perch mirror to hide foraging fun in. Makes putting the guys back in the cage easier if there are things they're excited to check out. Henry spends all day either on his laptop or on his cellphone. When Henry is on his laptop, Sweet Pea is on the cell phone. Each button plays different sounds when pressed! 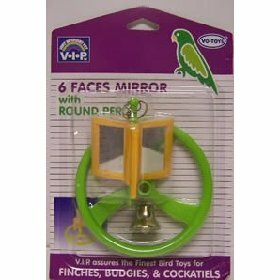 My favorite youtube budgie, Mango, loves his laptop mirror toy and cellphone mirror toy. 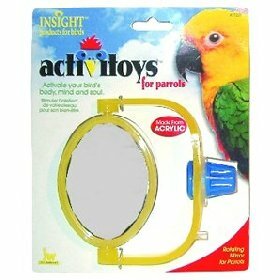 Activitoys make alot of great "activity-oriented" bird toys. 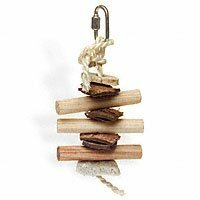 These toys get your little guys brains churning - often to figure out how to get some treat (foraging toys) or they have nice bells that are fun to wear as hats or make your squawks loud & echoey. Too much wonderfulness to be believed - 3 hottie budgies all staring right at you - holy wow! My guys can't get enough of this one. Kabobs, Pinatas, Shredders, Oh My! 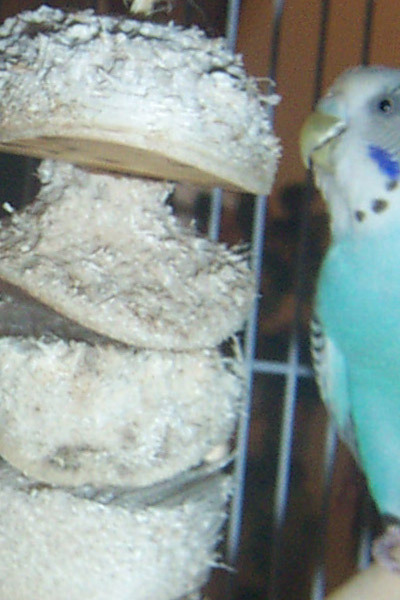 Pictured: Skye budgie & her kabob! 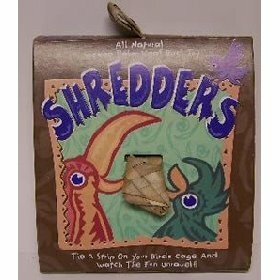 Anything a budge can chew or rip to shreds or otherwise destroy (kabobs, pinatas, shredding weaving ribbons, etc). My guys tear this thing up so that it is just a hut-outline made of sticks. Good times! Balsa wood blocks are best for chewing. The guys like shredding this. 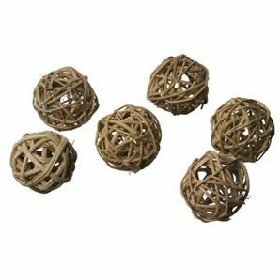 They tear these things up so they just look like a twig spider. 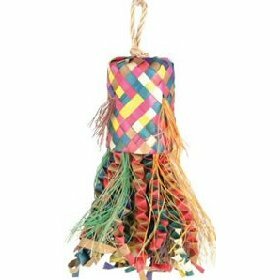 I weave these through all the cage bars - it's pretty and they get to chew stuff where ever they are. 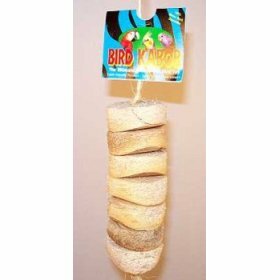 Huge fun & cute - hide surprise treats or millet inside. 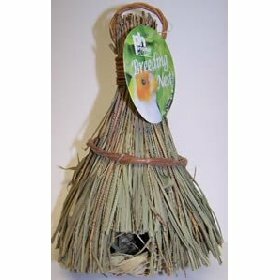 This is also a great way to get birds to go after toys and not be so scared of them at first - put some millet on it! Our lineolated parakeet, Grover, has no time for toys. He prefers playing tricks on the other birds, like hanging upside down and grabbing the side of a food bowl another bird is sitting on to eat and flipping it over. I caught him chewing up the pinata toy the other day. Grover! Playing with a toy! I recommend this one! 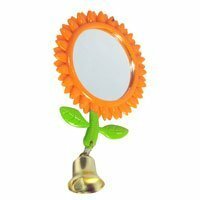 Our guys go nuts for anything with a mirror. & yes, they'll still play with the other birds & with you, even if they have a mirror-buddy. My guys love toys that make noise - not vacuum-cleaner type noise, but jingle jangles, obv. The skinnier budgies like to weave themselves in and out of the budgie rings like little acrobats. Henry's favorite thing ever. 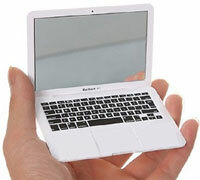 Record some words and teach your guys to talk - it is motion-activated. When a bird gets on the perch, the recording is played. Again, again, again-again! It can get annoying. Rowan at BirdyBooty.com makes the best bird toys ever. You tell her all about your guys - what they like & don't like & she makes toys just for them. It's just like Christmas when the box arrives - everything is packaged so beautifully. It's so much fun opening up each of the little toys to see what you've got. 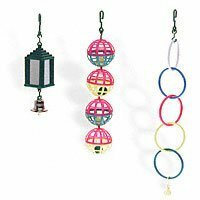 Even birds that hate toys will go crazy for these. 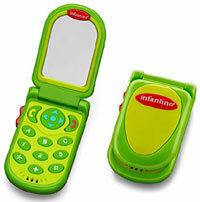 These toys have magic in them. The fabulous spatula bridge that my guys are all over in the piccie to the right is a BirdyBooty masterpiece!